Nevada Union's Dawson Fay (5) finds the open field and picks up big yards during a play Friday night against the Napa Grizzlies. Fay ran for a total of 247 yards and four touchdowns. 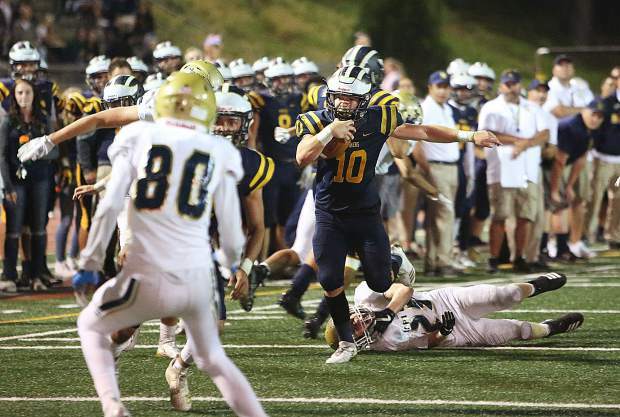 Nevada Union running back Hayden Lee (10) is hit from both sides by Napa defenders as he runs the ball up the sideline during Friday night's victory over the Grizzlies. Isreal Gonzales (4) weaves up the sideline during Friday's win over the Napa Grizzlies. 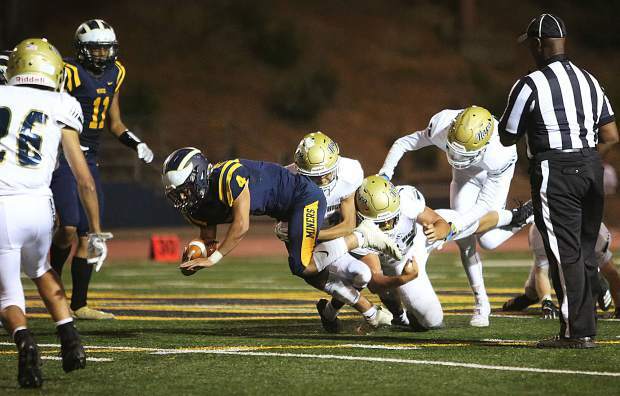 Nevada Union running back Logan Lopez (44) breaks through tackles as he moves the ball towards the end zone during Friday's 59-34 win over the Napa Grizzlies. 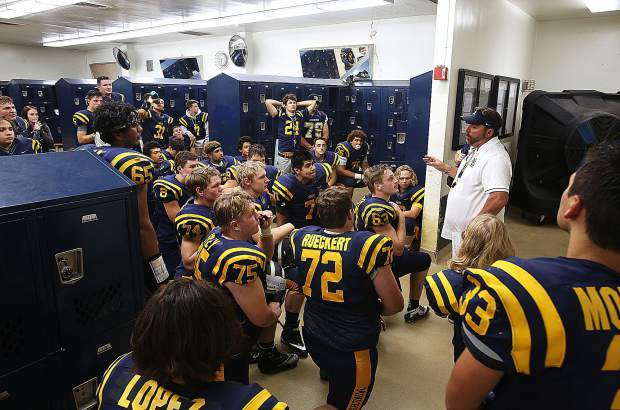 Nevada Union Miners varsity head coach Brad Sparks celebrates his first win as head coach along with his players and members of the community who cheered them on Friday night from Hooper Stadium at Nevada Union High School. Isreal Gonzales (4) dives to pick up extra yards as he is taken down by a slew of Napa defenders. Nevada Union running back Hayden Lee (10) picks up yards down the sideline as he ditches Napa defenders. 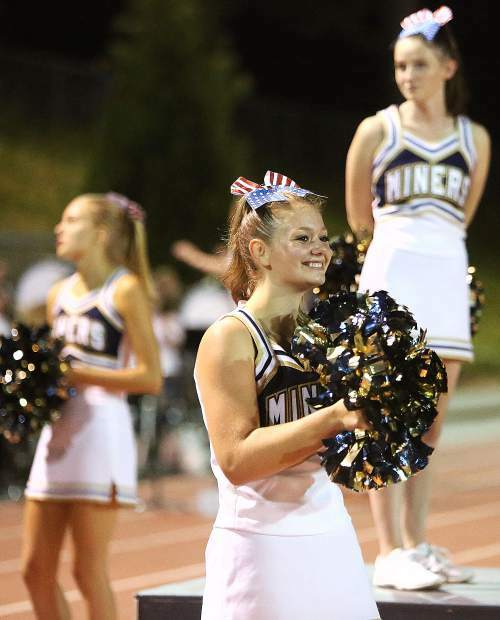 The Nevada Union Miners cheer leaders keep smiles on their faces throughout Friday night's high scoring matchup between the Miners and the Napa Grizzlies. 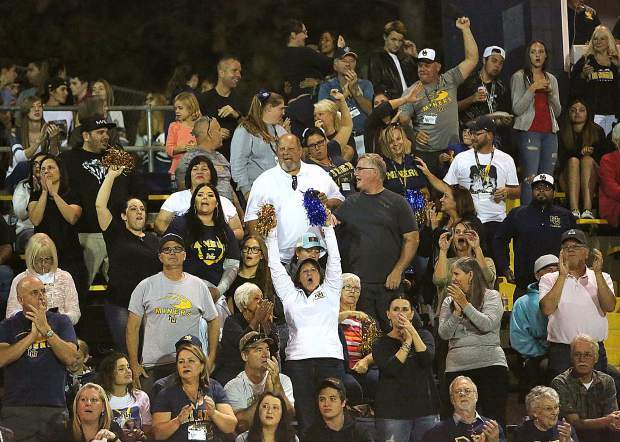 The Nevada Union High School Miner home crowd got to their feet many times during the high scoring bout against the Napa Grizzlies. Head coach Brad Sparks tells his team to fight hard to the end and not to let up during halftime where the Miners led the Napa Grizzlies 46-27. 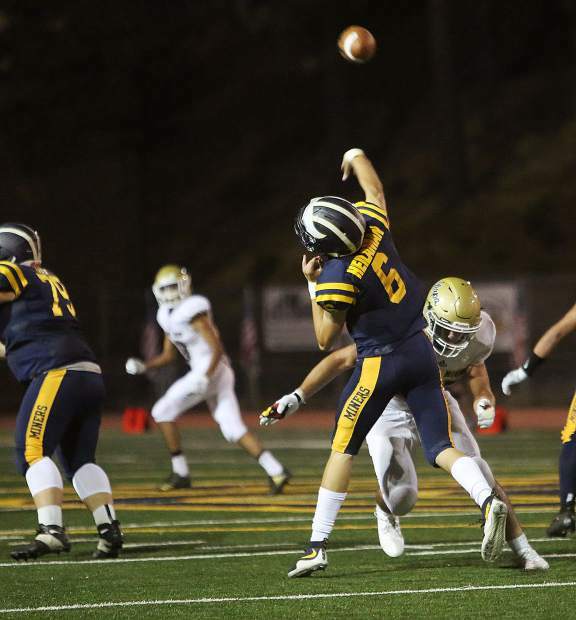 Nevada Union quarterback Parker Heilaman fires off a deep pass during Friday's home win over the Napa Grizzlies. 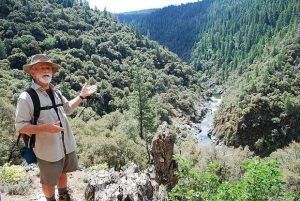 GRASS VALLEY — After struggling offensively through the first two weeks of the season, the Miners busted out in a big way Friday night. Playing in front of a raucous home crowd at Hooper Stadium, the Miners ate up more than 500 yards on the ground as they rumbled to a 59-34 victory over the visiting Napa Grizzlies. 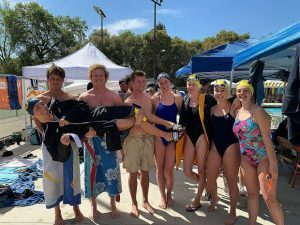 In an offensive showcase that featured more than 1,000 yards of combined offense, it was Nevada Union’s ground game that proved superior to and Napa’s aerial attack. 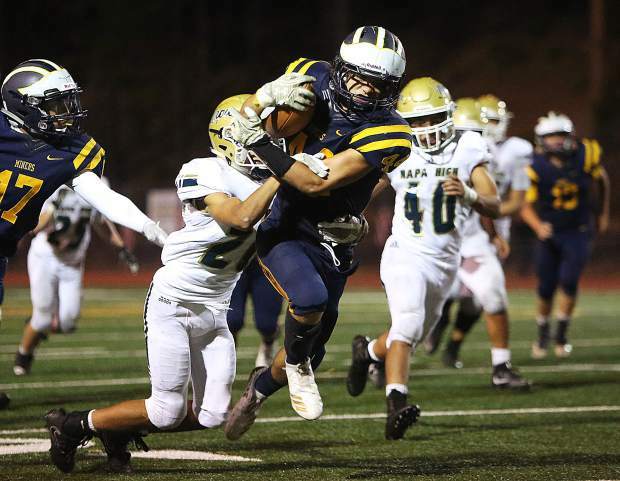 The Miners (1-2) were led on the ground by senior running back Dawson Fay, who sliced through the Napa defense for 247 yards and four touchdowns on 18 carries. Fay put the Miners on the board early with a 53-yard touchdown run on NU’s first possession. He would add touchdown runs of 78 yards, 25 yards and 4 yards before he was done. Winning the battle up front and paving the way for NU’s ball carriers was center John Low, tackles Dylan Hart and Christian Espinoza, guards Matt Dal Bon and Sammy Slay, and tight end Cameron Dallago. The Miners also got strong games from senior running backs Isreal Gonzales and Hayden Lee. Gonzales finished with 114 yards and a touchdown on 18 carries. Lee tallied 93 yards and a touchdown on eight carries. NU’s Jeremy Nettles added 33 yards rushing, and Logan Lopez chipped in 25 yards on the ground. 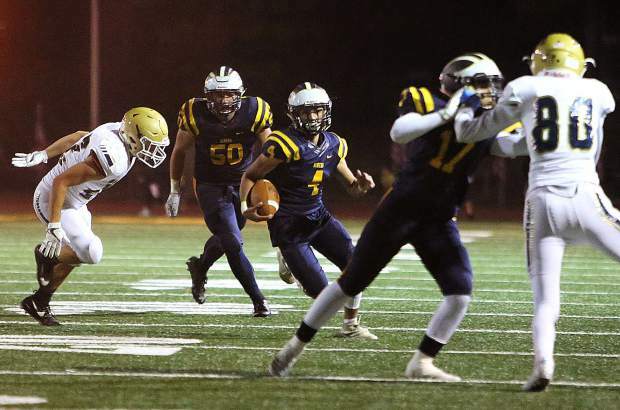 For much of the first half, Napa’s passing game was able to keep pace with the Miners ground game as the Grizzlies hit on touchdown passes of 77 yards, 72 yards, and 40 yards. 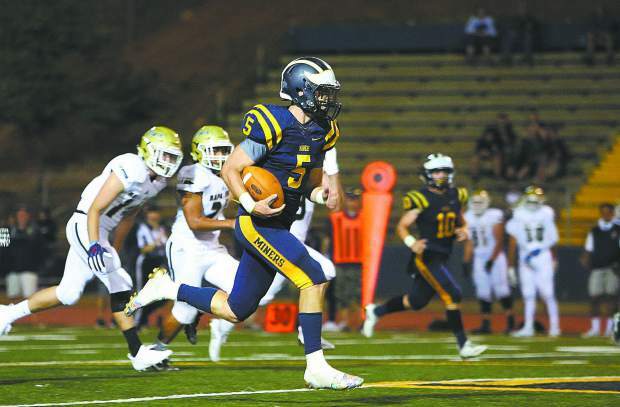 Napa quarterback Gunner Schoeps had 254 yards passing and three touchdowns by halftime. NU’s defense would stiffen in the second half, though, and Schoeps finished the game with 280 pass yards, four touchdowns and two interceptions. Schoeps was also Napa’s top rusher, notching 65 yards on 13 carries. 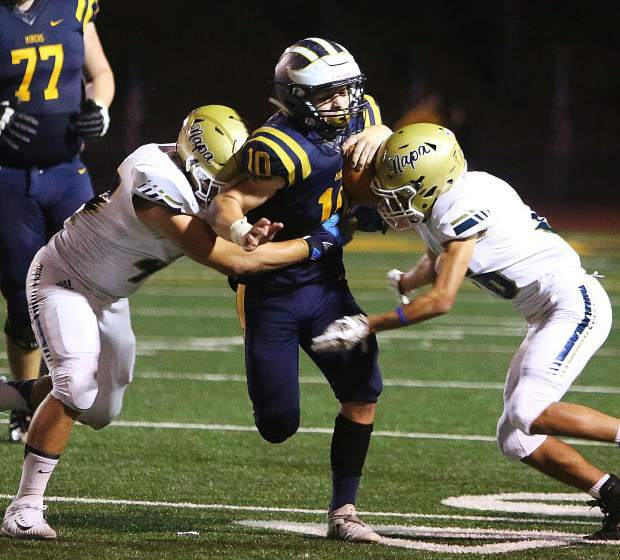 With Nevada Union’s run game humming, it opened up the passing game. Nevada Union’s senior quarterback Parker Heilaman logged his best game of the season so far, going 4-for-7 for 107 yards and two touchdowns. Heilaman hit sophomore Jaxon Horne for a 18-yard touchdown pass in the first quarter, and connected with senior Dylan McGilvary for a 57-yard touchdown in the third quarter. Heilaman also ran for a touchdown in the win. On the defensive side of the ball, the Miners had their best showing of the season and grabbed a pair of interceptions along the way, one by defensive back Bram Lofgren in the first quarter and another by linebacker Duke Morales in the third quarter. 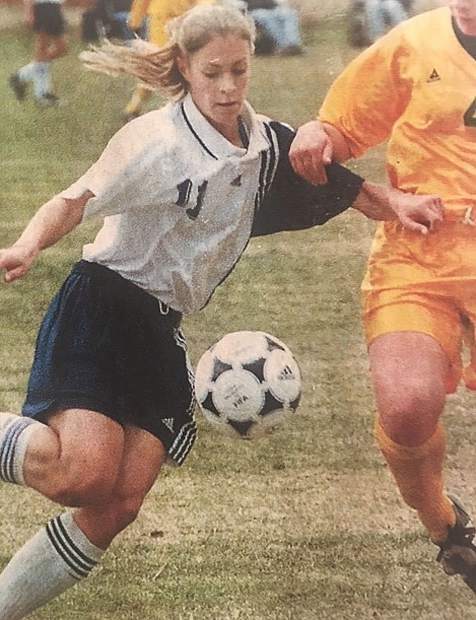 Dallago and Dal Bon also had strong games on the defensive side of the ball. The Miners scored 33 points in the first quarter and led 46-27 by halftime. 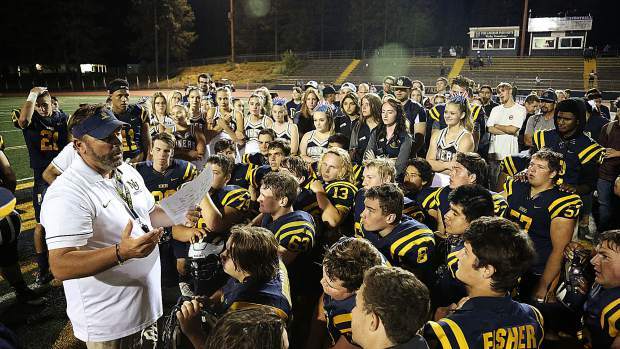 Nevada Union’s 59 points is their biggest scoring output since 2009 when they beat Napa, 62-12. The Miners have a bye next Friday and get back to it with a road game against River City (West Sacramento) Sept. 14. The junior varsity Miners jumped out to an 11-6 halftime lead, but couldn’t hold on down the stretch. After Napa took the lead, 13-11, late in the third quarter, the Miners responded with an 86-yard touchdown pass from J.T. Conway to Ayrton Swasey to pull ahead, 18-13. On the play, Swasey ran a slant pattern, made a great catch on a ball slightly behind him, then out ran the defense. Napa would respond with a touchdown pass on a fourth down play with just 1:51 left in the game. The JV Miners (0-3) drove down the field and gave themselves a chance with one last heave as the final seconds ticked down, but they couldn’t haul it in.